This is the first game in the Smuggler's Run series. 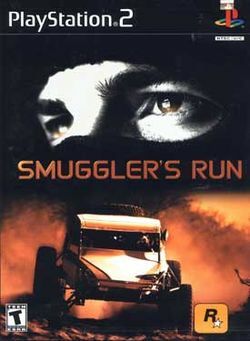 For other games in the series see the Smuggler's Run category. Smuggler's Run is a video game developed by Angel Studios (now Rockstar San Diego) and published by Rockstar Games for PlayStation 2 on October 26, 2000. In the game, you play a smuggler who has a number of different vehicles at his disposal including dune buggies, rally cars, and military vehicles. The vehicles are used to smuggle assorted cargo through three different large, open levels. The game, which was an early title release for the PlayStation 2 featured career and 1 or 2-player arcade modes. Two sequels for the game were also created: Smuggler's Run 2, which was released for PlayStation 2 on October 30, 2001, and Smuggler's Run: Warzones, which was released for Nintendo GameCube on August 6, 2002. The original Smuggler's Run is now a part of the Sony Greatest Hits series of games that have reached a particular sales milestone for the PlayStation 2. New to a local smuggling gang, your job is to smuggle cargo through three consecutive levels (forest, desert, and snow) with ten missions per level. In nearly all missions you must evade the U.S. border patrol, the CIA, or rival smuggling gangs. This is basically the career mode of the game. In addition to the main game, two other modes of play exist. In the turf war mode, you can play three different mini-games, two of which involve smuggling cargo while fighting against a rival gang. The final mini-game is a race through a popular spot through the level of your choice. Joyriding mode is basically a free roam mode where you can explore the level of your choice without having to evade the border patrol. This is a good way to become familiar with the levels and find a quick way through the level during smuggler's mission. This page was last edited on 26 May 2009, at 22:45.